The program will be launched at the wonderful ” Tea for Two” event planned for Friday 27th June in the Botanical Gardens, Cairns. I said to a writing colleague recently that putting the program together was like doing a Rubic’s cube whilst drunk. Right when you think you have everything in place you notice one tiny little problem, you make the adjustment, but … that leads onto another tiny little adjustment and so on which brings a cascading effect of hugely demoralizing proportions. I’ve taken a rest from fiddling for the moment. It will be ready for 27th June, it will be on the festival website and you will be able to start planning your festival experience. Which workshops, which chats, which book signings – so hard to choose. Seeing the program for the first time will be like opening a gorgeous box of chocolates. The difference is with a writers festival program it’s none fattening so you can gorge to your hearts’ content filling your head with knowledge and not gaining a single kilo! 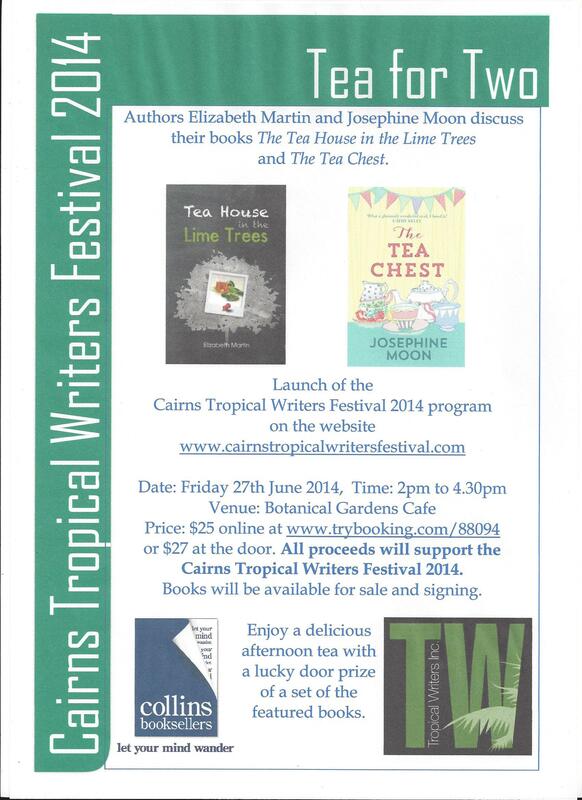 I invite you all to “Tea for Two”, hosted by Tropical Writers Inc. featuring the effervescent Elizabeth Martin and the intriguing talent of Josephine Moon. Collins Booksellers of Smithfield will be managing the book sales. I’ve been very quiet but very busy. I spent the latter part of last year redrafting my children’s novel in preparation for online presentation to a publisher. Online submissions are great; speedy, saves trees, saves on postage but you still go through the horrors of waiting to find out if that publisher is interested in your work. The guidelines said if the publisher didn’t get back to me inside 3 months then I had not been successful. Well … the deadline approaches – I’m feeling less than chirpy! However I have picked myself up dusted myself down and looked into other possiblities. I can do something on Friday 31st January so I will. Facing rejection after rejection is soul destroying so in order that I don’t completely loose faith in myself and my abilities, the other thing that has been absorbing my time recently is THE FESTIVAL! 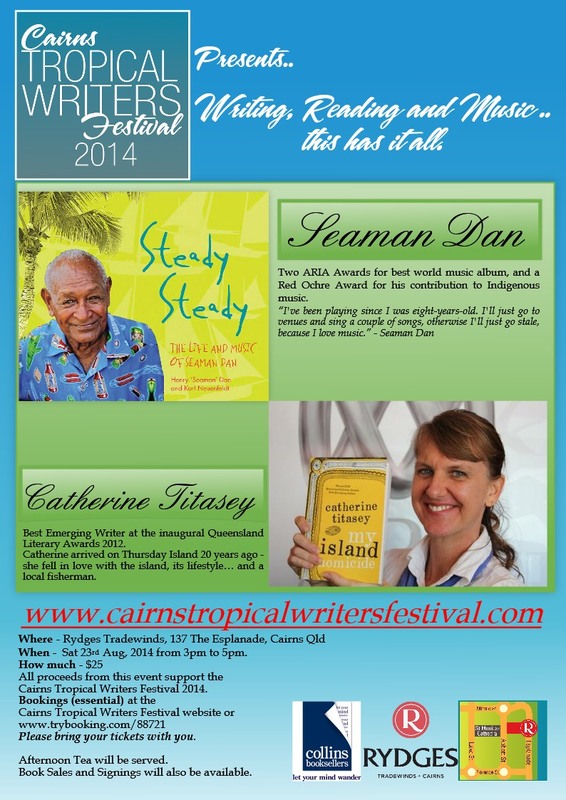 Yes Cairns Tropical Writers Festival is set to leap onto your calendar on Saturday 13th and Sunday 14th September 2014. My position on the committee is to represent the regional writers of far north Queensland in much the same way as I do on Regional Arts and Development Committee. So read on and find out how you can become involved with the 2014 Cairns Tropical Writers Festival – an initiative of Tropical Writers Inc. Your festival needs you and your ideas. Saturday 1st March 2014 – 10.00am to midday. I hope you are well rested and ready to launch into the festival year. CTWF committee has been busy behind the scenes for some months now but we’re at the point where we need your input. 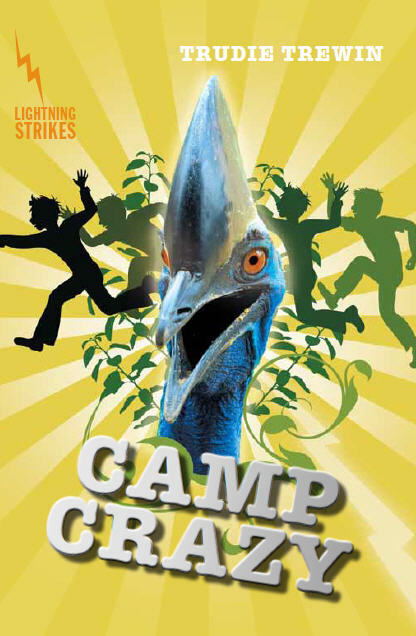 The popular Public Arena is an integral part of Cairns Tropical Writers Festival – it is a fabulous opportunity for local and regional writers to showcase their talent. The Festival committee has already received a number of innovative ideas for presentation in the arena but we want to offer yet another stimulating, entertaining and action packed programme. It’s been done before – three times – 2008, 2010 and 2012. Can it be done again? Absolutely! 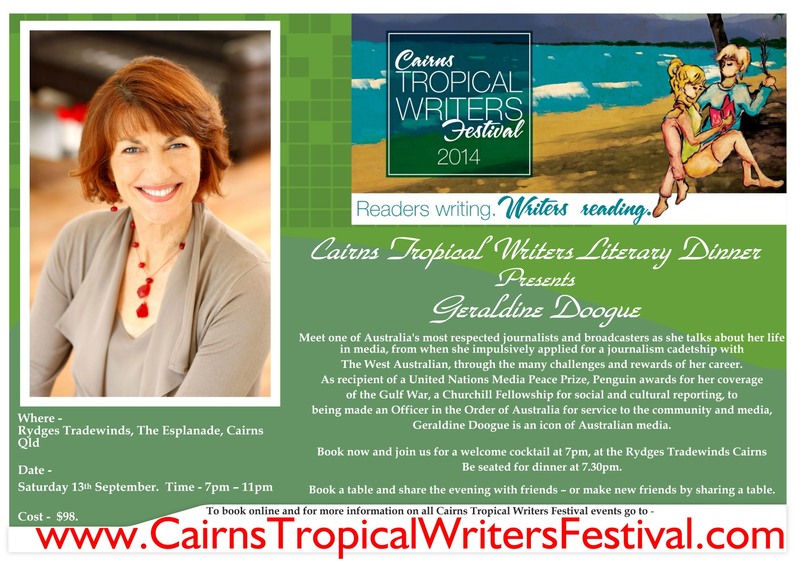 The venue for the fourth biennial Cairns Tropical Writers Festival is Rydges Tradewinds Esplanade – the same venue as 2012 and takes place over two days: Saturday 13th September and Sunday 14th September, with the Literary Dinner on Saturday evening. Please join the Festival committee on Saturday 1st March 2014 – 10.00am to midday for free morning tea served at 10.30am; poolside at Rydges Tradewinds Esplanade. Take the opportunity to have a say in your festival. Network with other regional writers, stimulate your coffee buds and your brain cells for a fun morning of brainstorming. We would really appreciate your feedback at each stage of the planning to ensure the program reflects Regional Writers current needs. Your details will remain confidential. We only ask that you include them so we can follow up on any suggestions or comments you make. There will be a follow up meeting on Saturday 5th April 10.00am – midday for those of you who are willing to become more actively involved. Please put the date in your diary but I will send out a reminder. For catering purposes it is very important to have numbers. Please RSVP to me – Diane Finlay at findpublishing@hotmail.com I’d hate you to miss out on cake. 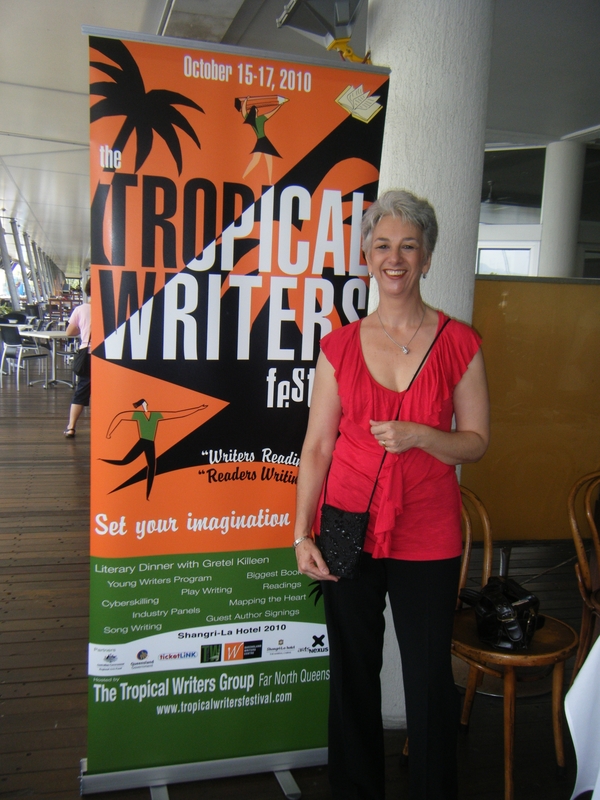 By spreading the word you will support the success of the 2014 Cairns Tropical Writers Festival and ensure that people in your network have the opportunity to be involved in an inspiring event. Like a butterfly I’m emerging from a cocoon. Unlike a butterfly I didn’t cocoon instinctively it just sort of happened! A wonderful holiday – then something left field, followed by Tax time (and it is taxing on my brain sometimes) then the coming of the Great Snot – there’s a story in that … I was poleaxed. I’m not often ill and rarely badly affected when I am – maybe it’s my age and I get it big and bad now. This brings me to the point of this post. I’m putting myself back into the driving seat and reminding myself of the reason for my Virtual Coffee series of interviews. It’s been a long time since I’ve posted and there are authors out there who are wondering if I’ve forgotten them. I haven’t. I’m pinning myself down on this one – there will be a new Virtual coffee interview next week. There now I’ve said it – it’s in print so I must hold myself accountable and produce the work. I think another reason for posting the front cover of my e-book apart from the obvious Shameless Plug – the marketing arm of Find Publishing Pty Ltd. is to remind myself that I am able to set goals work steadily towards them and achieve a good result. This is something I have to draw very heavily on when working on my children’s novels. Why don’t the publishers want them? I just haven’t found the right publisher yet. If only NSW School magazine published children’s novels – the editorial team there totally get where I’m coming from and have published several of my children’s short stories and poems. So … if I can do it there I can and will do it somewhere else. I’m not a terribly patient person and maybe this is the lesson I’m being taught in this part of my journey as writer. I have to have some sort of take-away other wise what’s the point? I’m never too sick to read. Coffee with clouds and daffodils. I’m letting you all in on a little secret. 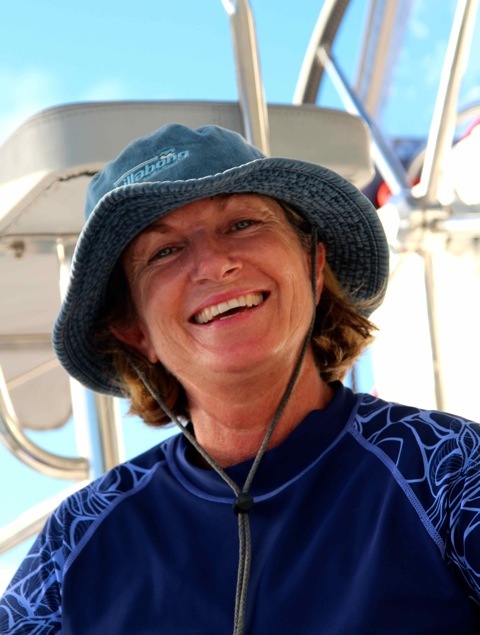 I know Helene has told everyone she has been sailing – she has – but that was her stunt double. The real Helene has been with me in Grasmere in the Lake District on the west coast of England. Her stunt double did such a brilliant job that even Zeus didn’t work it out. Not too sure about GW though – I think he just played his cards close to his chest. As a writer of romantic fiction I thought Helene would enjoy a short romantic visit to Grasmere. William Wordsworth’s grave is in the beautiful little church yard of St. Oswald’s; it is springtime and despite a long, cold winter there is, ” a host of golden daffodils” , bending their heads in the chilly breeze. A weak spring sun filters through the new green leaves; it rained early this morning and the earth smells damp, the mosses are vibrant green. As idyllic as this is, it’s too cold to stay out especially for two far north Queenslanders. We take the short walk to The Grasmere Gingerbread shop – this is a must do – the best gingerbread in the world bar none. Laden with our purchases we aim for Greens Cafe for coffee and lemon drizzle cake or sticky toffee pudding or brownies. Anyway something naughty to go with our coffee. As we get comfortable I ask Helene what she has been working on recently, she takes mouthful of coffee as she gathers her thoughts. I had such a great time last years as well so I’ve already RSVP’d I don’t want to miss out. We move onto more details of Helene’s recent success. 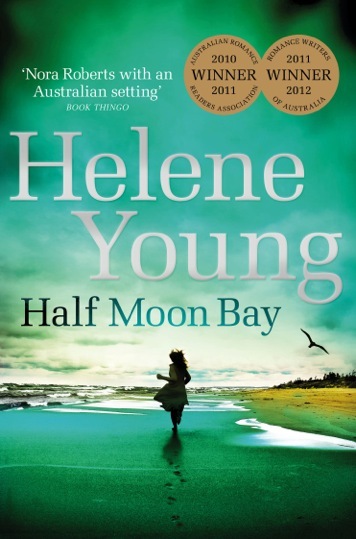 “My new Australian suspense story Half Moon Bay, will be released on 22nd May by Penguin Australia.” She pulls out the proof copy from her bag and reads the back cover blurb. “Ellie Wilding has been running from her past, but when the residents of Half Moon bay call for help she knows it’s finally time to return home. As an international photojournalist, she’s used to driving in to war zones, but she’s shocked when it erupts in the sleepy hamlet on the north coast of New South Wales, threatening all she holds dear. 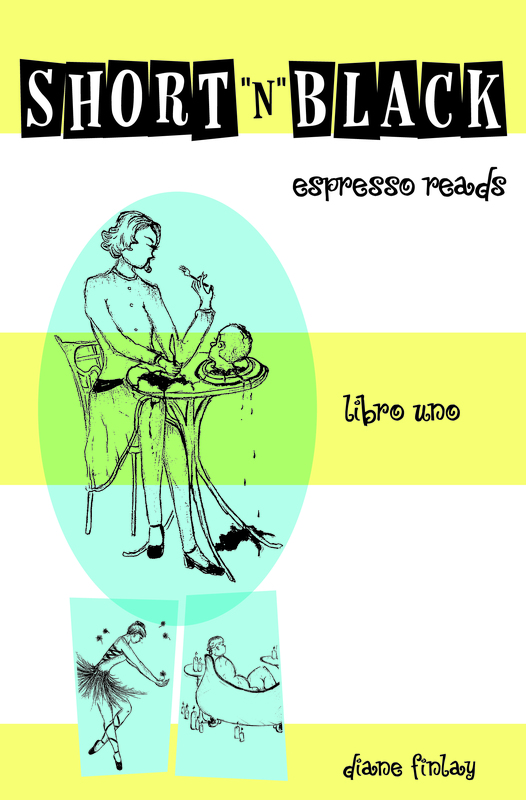 I could go a stiff drink now – however if you want to know a little bit more ahead of the launch visit Helene’s webpage to read the first chapter on the ‘books page’. We decide to pay up and go. There is still some blue sky outside – this is the Lake District – so we have to take advantage of it. We wend our way back to the churchyard, it’s such a tranquil spot. I ask Helene what advice she would give to an aspiring writer. She had this to say, “Write what you love to read. Remember that rules are for fools and the guidance of wise men. I always cringe when I hear another writer saying, ‘No you must do it this way.’ And my pet hate is, ‘You can’t write until you’ve plotted your story.’ I haven’t plotted any of my four books and have no plan to start.” I’m so relieved to hear Helene say this – I’m a none-plotter. She continues, “It doesn’t work for me but that doesn’t mean it won’t work for you. Listen to your voice and remember the book will only be written when you put your bottom on a seat and your fingers on the keyboard.” Telling it like it is. I’ve enjoyed this interview immensely I love the Lake District – it has a special place in my heart and I know Helene has that same connection.